One of the challenging parts about blogging is sourcing big, beautiful and relevant pictures that you can legally use on a regular basis. Yes, you can publish without photos. But you’ll be missing out. 90% of the information that comes to the brain is visual. We recall pictures 6 times more easily than text. So, don’t let finding the perfect image stop you from creating great content. Here is everything you need to know to create beautiful blog posts, every time. What Pictures For A Blog Perform Best? Use images to capture my attention, so you can tell me your story. If the image is small or boring, you’ve lost me. If it’s cool but doesn’t relate to the rest of the post, you’ve confused me. Exactly. This is a prime example of what not to do. Make it easy for your readers to visualize what you’re saying. We saw a change in our readership engagement once we started using full images in our posts. The average number of comments increased, and more importantly, we were sharing a stronger message with the 84% of people who skim our posts instead of read them word for word. If you’re talking about trends in data, try to find a graph. And comment on it to highlight your angle. Remember, it’s not enough to share something, we want to see why you’re sharing it. 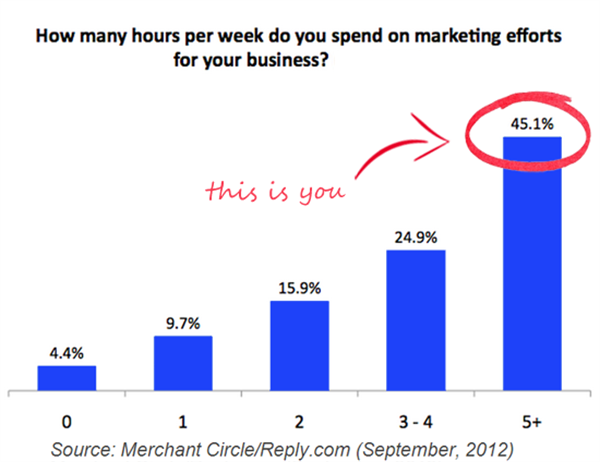 For example, in our post on what other small businesses are doing online, we used the following graph to highlight how many hours the average small business owner spends on marketing each week – by calling attention to the most important part of the graph, it felt more like a conversation. p.s. Always include the source and link to where the image came from. It’s also good practice to email your source to thank them for creating the content, and let them know you’re using it on your blog. In addition to being a good online citizen, it can be the start of a relationship (relationships with people who conduct original research are vital to being an authority), and if you’re not permitted to use the image, a personal note is the best way to find out. One in 9 of us has a smart phone. Chances are you’re one of them. Use it to capture what goes on behind the scenes with your business, your customers and other things your fans will enjoy. It’s the fastest and cheapest way to add original images to your post. You can even use free services, like Photoshop’s Express Editor or Instagram, to edit photos before you use them in your blog so they’re more enticing. If you sell a unique product or service, or you’re writing a special post or ebook, consider investing in a photographer. Not only will you get remarkable photos, you can use them on all of your touch points (website, blog, promotions, booths, social media, etc…). Remember – sell the solution, not the product. 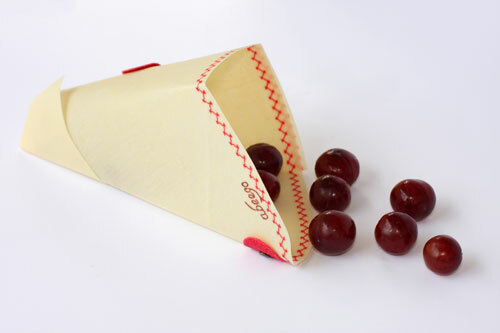 Some of my favourite examples of this are from a company based in Victoria, Canada called Abeego, which produces natural food storage wraps from beeswax, jojoba oil and tree resin. 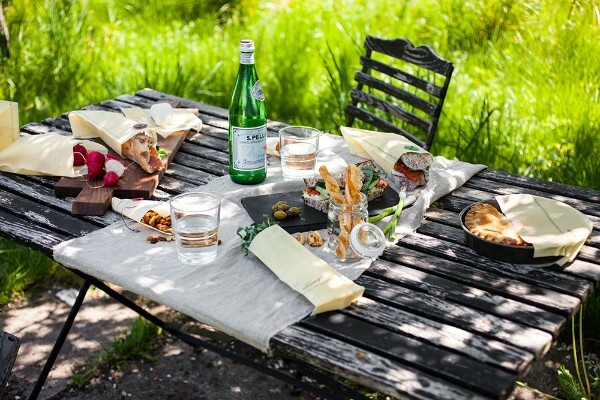 They recently redid all of their marketing photographs to move away from product shots and showcase “the Abeego lifestyle.” I love it. Helping your customers visualize how your product or service fits in their lives is a great step to making your next sale. p.s. Since most small business owners spend less than $2,500 a year on marketing, and personalized photo shoots can be expensive, you can also try student photographers. You’ll stretch your dollars more, plus they’re usually keen to make a name for themselves. And from my experience, do a beautiful job. You can use free stock images donated by photographers around the world. Flickr has a fantastic creative commons with over 40 million photos for you to choose from. My other favourite is CreativeCommons.org, which searches a variety of free image, video and music services (including flickr, Google Images and Wikimedia Commons) so you can see all your options in one place. Make sure the sharing licence also applies to businesses, as some photographers only donate to non-commercial ventures. And some only allow you to use their image without modification. See the licencing page on flickr for a better idea of how to make sure you’re using photos legally. Sometimes you just can’t find what you’re looking for in the free section. 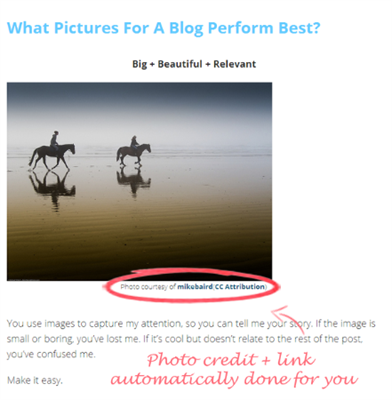 For those special posts that you really want to promote, you might consider buying photos. There are a ton of services you can use – Lisa from PaySimple did a good review here. We also love Veer, as the have a fun and creative selection of photographs for a reasonable price (between $10-$20 an image). Even with these tips, finding big and beautiful images that you can legally use on a regular basis that are relevant to your post can be a challenge. So we decided to make it a little easier. 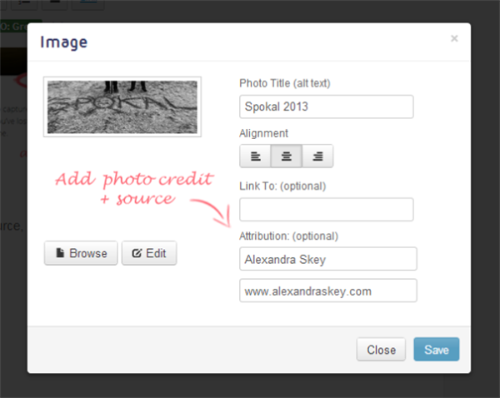 If you’re using Spokal, you can now drag and drop images right into your post from flickr’s creative commons library. We automatically display images for your keyword (although you can find any image by doing a new search) and we automatically attribute the image (and include a link to the licence), so your photos will be properly sourced every time. 2. Drag + drop them into your post. 3. Photo credit is automatically done, including a link to the source. You can also upload photos from another source, and use Spokal to credit them so all the images on your blog have the same format. Simply go to the editor and hit the image icon on the right to start your search – Spokal will take care of the rest. No worries – you’re welcome to sign up for your free 14 day trial, and in addition to the photo attribution service, you can use the entire Spokal platform during that time. And as always, if you have questions give us a shout at 1-888-470-5990, send us an email or ping us on Twitter. Google made a change to their algorithm last year that increased the number of images they return in search results. This means that while your post might not rank on page 1 for a keyword, a photo you used in that post (properly optimized with a keyword) could appear in the images section on page 1. Images don’t just improve your message – if you properly optimize them, you have a better chance of making sure your customers find you! So, what else do you do to add visual content to your posts? This is a good one. SMB’s, PAY ATTENTION, watch your attributions and don’t use images that you don’t know where they came from. Getty images has a very advanced algorithm and search bot that scours the internet for their images and check to make sure you have a license. We pulled an image off of Google Images without doing our research and it cost us $1k. Thanks for sharing your story. That’s a great example indeed. It’s so easy to make that mistake with good intentions, so appreciate your share. Yeah, we love Getty images. But they’re expensive to buy! Haha, “love” isn’t a word I’d use to describe my feelings towards Getty… but that’s another post entirely (and all my fault).